Good grief, I have been wordy this weekend! So much for short posts. The truth is, all this going on about colors and fuzzy things and inspiration has been leading up to this, a two-part intro for another series of short posts. This time, about some experiments I’ve been doing on color and spinning. Deb Menz, Color in Spinning, Interweave: 2005. Click for link to Amazon. 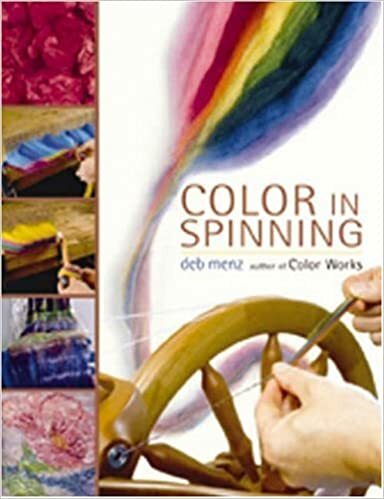 When I picked up this book, and flipped to the chapter on spinning with hand-painted roving, I thought she was going to talk about how to get different kinds of color combinations out of the sort of handpainted rovings that you would purchase on Etsy or at wool shows. That’s what’s been really popular for the last several years: there are any number of amazing dyers and fiber processors out there, so the contemporary problem is how to make different and interesting things out of a small batch of multi-colored fiber that someone else has dyed. That is not what Ms. Menz is doing. Ms Menz assumes that, if you want to control the color in your spinning, you will dye the fibers yourself. She then teaches you to combine the different fibers you dye in all kinds of different ways. Essentially, this book is trying to teach you how to mix colors of fiber like you would mix paints on a palette. Her end products are almost all some kind of heather or marl, yarns that create one overall impression of color, but with differing levels of depth or complexity because of how the colors are blended in each ply and then plied together. Her chapter on dyeing with handpainted roving, in addition to giving you directions on how to hand-paint roving, is mostly about what’s called “combination drafting.” That’s when you strip a roving or top down into thinner pieces, then hold two different pieces together as you draft. It puts both colors into the same ply. As I said, she’s assuming that you want to create some kind of uniform-ish heather, and you can control what it looks like by what colors you put into the yarn. Since you can put any number of colors onto the roving when you’re dying, and hold up to six strips together when you’re combo drafting, and then have anywhere from 1-4 (or more) plies into a finished yarn… The possibilities are truly mind-boggling. Indeed, the yarns can easily get so complex that many of her most complicated samples look like reddish speckled mud. I think that’s why I was a little put off when I tried reading this book originally, when my dad impulse-bought it for me and Mum. But this time, I flipped to the back of the book, to her project gallery. There, I saw what she was making with these yarns: putting upwards of 40 nuanced shades of heathered yarns together to make stunning art pieces, from landscape scenes knit into sweaters to tapestry-woven stuffed statuettes. You might never want to do that, but you absolutely have to admire it. My mind, indeed, was boggled. Now, I wouldn’t normally go through such an involved process in my spinning. (Nor do I have any inclination to make tapestry-woven statuettes.) I have mostly contemporary dyed rovings and tops and batts in my stash, and I have contemporary questions about how to use them. But. What I have on the wheel right now is perfect for this kind of approach. Ten small tops of color. Already beautiful, but ready to be blended into something amazing. Tomorrow: what I’m going to do with them.